Create scrappy looking quilts without scraps or a stash - just buy a bundle! Pre-cut bundles include small cuts of many different fabrics, so getting a scrappy look is a snap. Simply pick you favorite pre-cut: layer cakes, jelly rolls, or fat quarters (a quilter's favorite). Choose just 1 or 2 pre-cut bundles plus a background fabric to make any of these beauties. From simple Shuttle and Four Patch to striking Bear Paw and King's Crown, it is easy to create lap sized and larger quilts with a fresh twist on yesteryear's blocks without the time needed to make them. 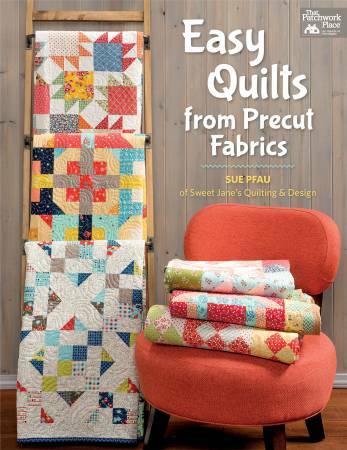 Easy Quilts from Precut Fabrics includes 18 scrappy quilt patterns that are fun and quick to make. Pre-cuts are hot and in these patterns, no fabric goes to waste. Efficient techniques for pre-cuts means less cutting and pressing steps. 48 pages.